Cynic makes technical, progressive sounding music sound fun and emotional. These guys are masterful technical musicians, but more importantly, they are great song writers. Cynic’s 1993 opus Focus disemboweled everyone’s expectations about what death metal could sound like and expanded the boundaries of extreme metal in ways that are still being felt today. That was more than 20 years ago and Focus still sounds as shockingly unique, compelling, and downright strange as it did back then. It really tells you something that, as fiercely distinctive and influential as Focus was, no other bands has ever really been able to reproduce Cynic’s sound. Imagine if Close to the Edge-era Yes was making out with Morbid Angel’s Alters of Madness while Bruce Haack read ancient Sufi poetry to them through a vocoder and you would have some idea of what Focus sounds like. 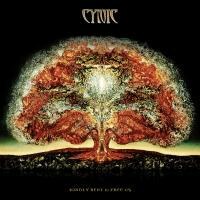 Cynic is one of those bands that might have been just a confused mess of influences, but somehow bring all of these apparently contradictory elements together to make something fascinating and cohesive. Much to everyone’s chagrin, Cynic fell apart after the masterful Focus and did not reunite until 2008’s Traced in Air. Much to everyone’s delight, Traced in Air picked up more-or-less where Focus left off, adding even more melody and mystical themes. Both Focus and Traced in Air are all about contrasts; the gorgeous melodies and clear, fragile, clean vocals juxtaposed against the harsh vocals and chunky death metal riffs, and all of it sent into some strange new dimension by Paul Masvidal’s bizarre but somehow perfect use of vocoder. There is so much dynamism in these two records, so much light and darkness complimenting and accentuating one another. After their triumphant return with Traced in Air, Cynic officially established themselves as one of the most talented and unique metal bands on the planet. Particularly since 2011's Carbon-Base Anatomy EP, it has been clear that Cynic are more interested in being a progressive rock band than a death metal band. Not only do they have the musical chops to stand up to the likes of Dream Theatre and Marillion, their songs are also far catchier and more memorable than the aforementioned prog rockers. Cynic’s new record Kindly Bent to Free Us is the logical culmination of this process of “de-death metal-ification” that they have been threatening to fulfill for some time. Whereas they used to be one of the oddest, most original, and most wonderful extreme metal bands in the world, now they are just possibly the best progressive rock band in the world. And that’s fine. Most prog rock is unspeakably dull. It is a great thing for Cynic to show the kids who hang out at Guitar Center and attend the Berklee College of Music that rock music can be technically sophisticated and catchy as hell at the same time. Kindly Bent to Free Us is filled with big, lush, fun as all hell numbers like opener "True Hallucinations Speak" and the title track. Cynic makes technical, progressive sounding music sound fun and emotional. These guys are masterful technical musicians, but more importantly, they are great songwriters. With that in mind, I can’t help but feel like Kindly Bent to Free Us lacks the contrast and sui generis quality of their first two albums. On Focus and Traced in Air, Cynic managed to do something that is extremely rare: They crafted a sound that was totally their own. Kindly Bent to Free Us is a very good record. I seriously doubt that I will hear a better progressive rock record this year; however, it partially abandons the unique sound that made Cynic so special. They still more-or-less sound like Cynic, but with the death metal elements pretty much gone, so too goes a big piece of their distinctiveness. With any luck, the lack of harsh vocals on Kindly Bent to Free Us will attract a much wider audience to Cynic’s banner than they were able to get with their more death metal rooted stuff and those of us who have loved Cynic for years will always have the first two records.